Can you counter Progenitus' replacement ability? How does countering triggered or activated abilities work? 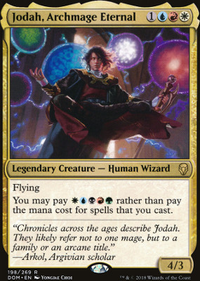 Don't like Voidslime , Dissipate , Library of Leng , cut some of the redundant slivers, your commander can tutor you can search for the slivers you need. Add in more ramp, Farseek , Rampant Growth , Nature's Lore . Cut some of the greedier cards and replace them with cheaper effects. 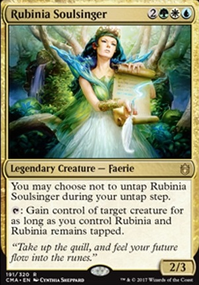 like Swan Song , Stubborn Denial , Dispell for the counterspells. add in more interaction, Abrupt Decay , Path to Exile , etc. What way do you want to focus the deck, if combo or combat? Fellow slime enthusiast here, with some cards that I think ooze flavor. Voidslime is great, Ooze Flux works amazingly well, Gelatinous Genesis makes tokens, Ravenous Slime hoses graveyard decks, and Experiment One is a solid one drop you can use for kraj. Best of luck! Thanks Dankey for the tips. I’ll certainly look at some more dorks for the list. Only reason Voidslime is there is because it came in the deck, so I’m not really sure if it’s not necessary to have another copy. My LGS was sold out of Command Tower , so that’s the first planned addition to deck. Thanks for your help. 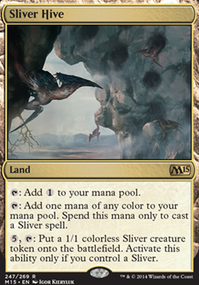 Disallow is strictly better than Voidslime , and less expensive to boot! Running several mana dorks is always a bonus to most green lists. 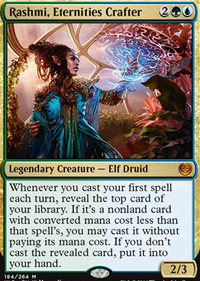 Arbor Elf , Birds of Paradise , Boreal Druid , Elvish Mystic , Fyndhorn Elves , Llanowar Elves , and Priest of Titania all come to mind. 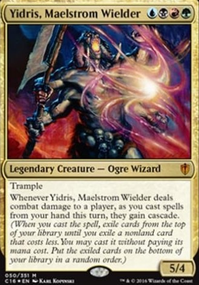 You can also include Noble Hierarch if you can get a good deal on one. I also have replaced Dissolve with Voidslime , because I like how it is redundant with Disallow . Madcookie on Infinite Draw Combo? 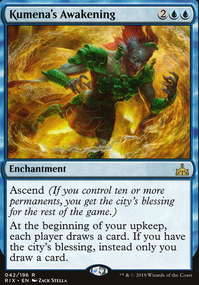 Yes, unless the loop is broken, you will draw your entire deck. 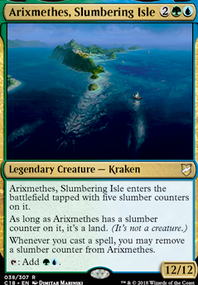 It usually comboes nice with Laboratory Maniac to win at the end of the deck or Purphoros, God of the Forge to kill everyone with pings. For the second question yes, Kindred Discovery 's ability is a triggered one and can therefore be countered with cards like Stifle , Voidslime Disallow etc. Sidenotes(from the rulebook):603.1. Triggered abilities have a trigger condition and an effect. They are written as "[When/Whenever/At] [trigger condition or event], [effect]. [Instructions (if any).]" 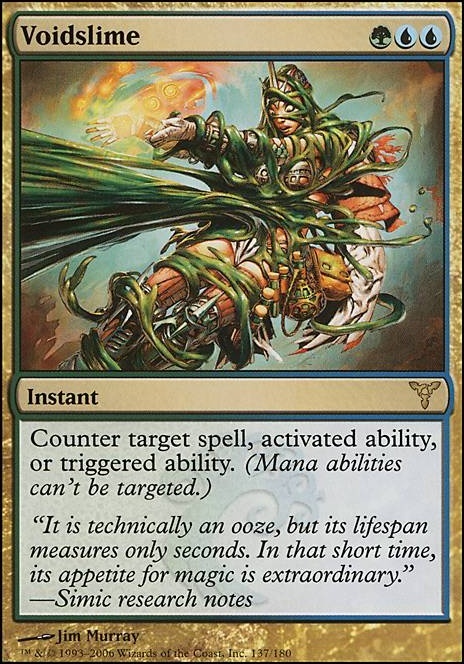 Yeah, maybe ... though the deck generates enough mana that it's probably better to use a three-drop that will also hit triggered abilities (e.g., Nimble Obstructionist , Disallow , Voidslime ). I'll definitely keep Squelch in mind though once I start testing!